The EXO-C110 is Scorpion’s next generation take on a classic helmet. The EXO110 features subtle modern lines, an advanced ventilation system, a dual EPS liner, and an improved SpeedView sunvisor mechanism. These features allow the EXO-C110 to provide a premium feel while maintaining the classic half helmet look and fit. Note: The EXO-C110 runs slightly small. If you are between sizes, order the larger size. Bought this for my wife as her first half helmet. We’ve ridden sport touring bikes for the last 30 years and are new to the cruiser world. Wanted something different for her to go along with my GMAX half helmet. A little larger over all when compared to the GMAX but still doesn’t cause the “dreaded” mushroom head. Love this helmet. 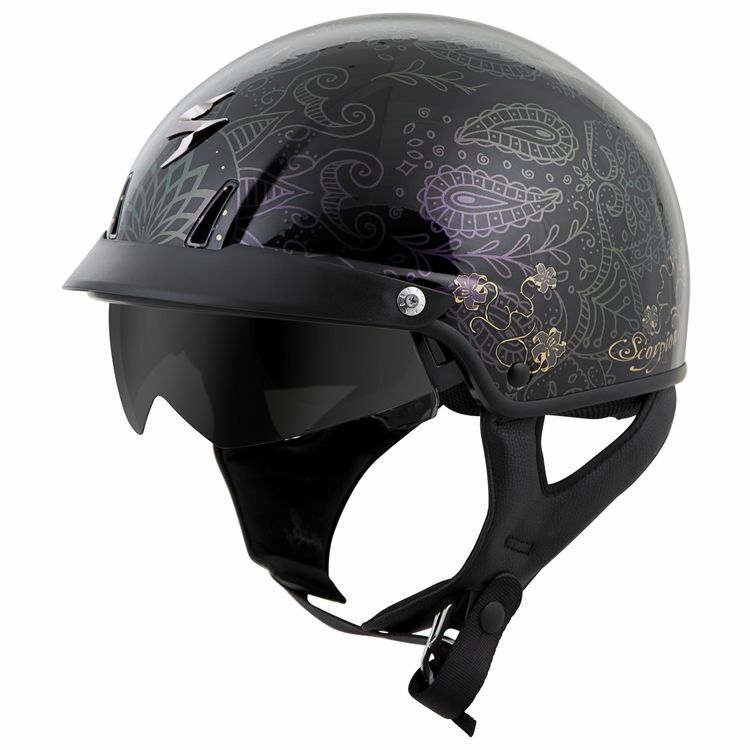 I was looking for a half helmet with a bit of femininity lbut not overdone or too girly looking.. Absolutely love the graphic design and would definitely purchase again if needed. Fits a bit snug but padding needs to be broken in a bit and should then fit great. I bought this helmet for increased air flow on hot days. It has not disappointed me. It's comfortable but I find the fit to be a little more snug at the top than anticipated. Not uncomfortably snug and not enough to increase to the next size up. There may be a little give as the liner compacts with use. I bought a medium. Write your review here. It must be at least 25 characters long. Consider whether you would recommend this product and what you like Beautiful helmet! Love it!! !or dislike about it. Bought the helmet for my girlfriend. It fits well and looks great. She loves the look and the tinted sunscreen. Couldn't be happier with it. Could've spent alot more on a Harley Davidson helmet and got alot less. Watch the RevZilla video and and get one. So I first purchased the Bell Sena Mag 9 (small) for my wife. It was rather snug and she felt a bit claustrophobic. She decided to order a half helmet instead which she normally wears anyway. First, let me say the guys at Revzilla are FANTASTIC!! No issue whatsoever with returning the Bell. Anyway, she saw the video for the Scorpion EXO Azalea, liked the features and so we went with it. It's a nice helmet and the colors do change in the sunlight. She had no problem with the fit (size small), but note that it sits really high on her head. Major mushroom head! We also found that the speaker pockets are very small and will not accept the Harley comm system speakers. We had to Velcro the speakers to the outside of the pockets. Other than those few little hiccups, it's really a nice helmet.